Chicken Alfredo Rollups ~ Creamy and Delicious! 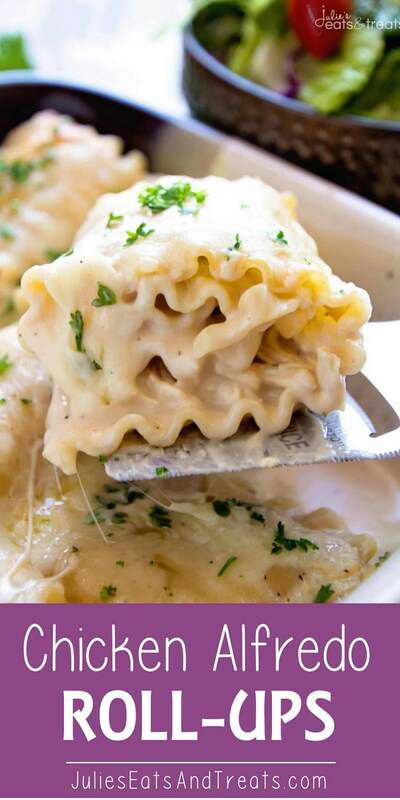 Lasagna Noodles Stuffed with Chicken, Cheese and Garlic Alfredo Make for a Quick and Delicious Dinner! 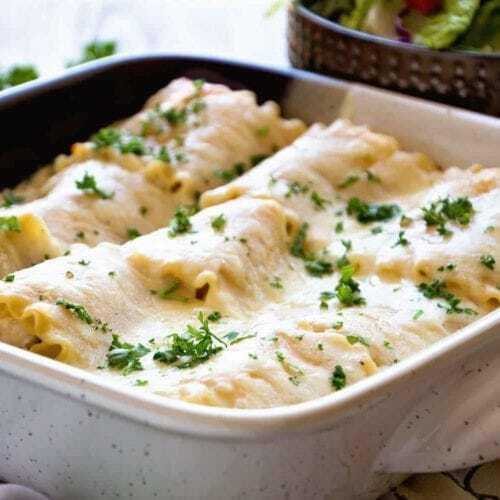 These Lasagna Roll Ups are freezer friendly and also make a great recipe to share with family and friends when they are sick, had a new baby or anything. Always a hit for dinner. Is it lasagna or is it not? That’s the big question. 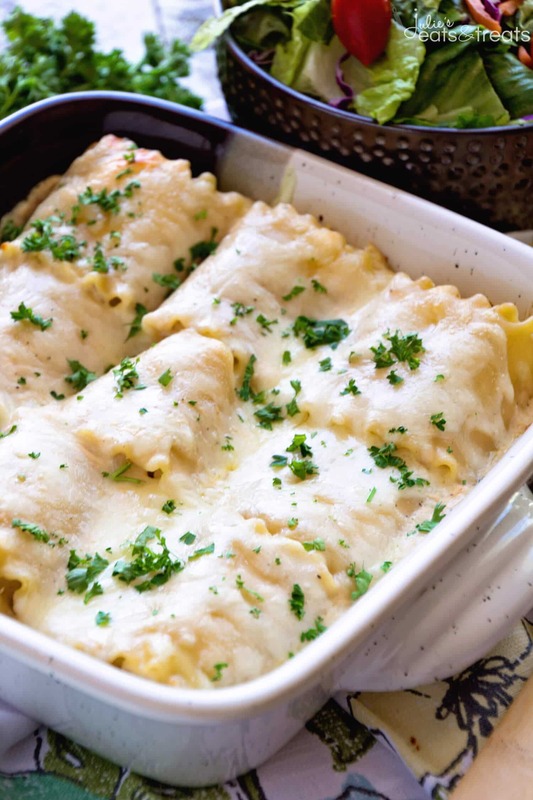 These cute little lasagna roll ups are a play off of the typical old lasagna. Throw in some Alfredo sauce instead of marinara and we have a fun new twist on lasagna. I love lasagna as you can quickly see. Give me some of Mom’s Lasagna and I’ll come running from far away! Mix it up with Ham & Cheese Overnight Breakfast Lasagna! If quick is what you are looking for then I’m all about the Skillet Lasagna. This meal does take a little bit of time to get on the table so I’m going to share my secret with you. Ready, ready? It’s really not that brilliant. I need a disclaimer here. Just make it the night before, get home and pop it in the oven or even a few days before hand! This is also the perfect meal to send to someone who just had a baby, is down on their luck or just needs some love from you! Can I be that person? To go with this fabulous dinner I whipped up a side of Olive Garden Breadsticks to serve with it. A nice accompaniment to finish off this meal would be a simple tossed salad. How do I make Chicken Alfredo Roll Ups? Spray an 8×8 inch pan with non-stick spray. Pour 1/2 c. Alfredo sauce on bottom of pan. Cook lasagna noodles until they are al dente. Don’t overcook them as you will be baking them also. Drain and rinse the noodles with cold water so they don’t stick together. While they are cooking mix together the 1 c. Alfredo, 1 c. mozzarella cheese, chicken, garlic salt and oregano. Lay out the noodles and blot the water off of them with a paper towel. Spread 1/9 of chicken mixture on noodle. Roll up the lasagna noodle. Place the roll-ups, seam side down in the pan. Repeat with all of the noodles. Once they are all in the pan pour the rest of the Alfredo sauce over them. Top with the remaining cheese. Bake at 350 degrees for 30 minutes. Trust me, there won’t be any of this left! 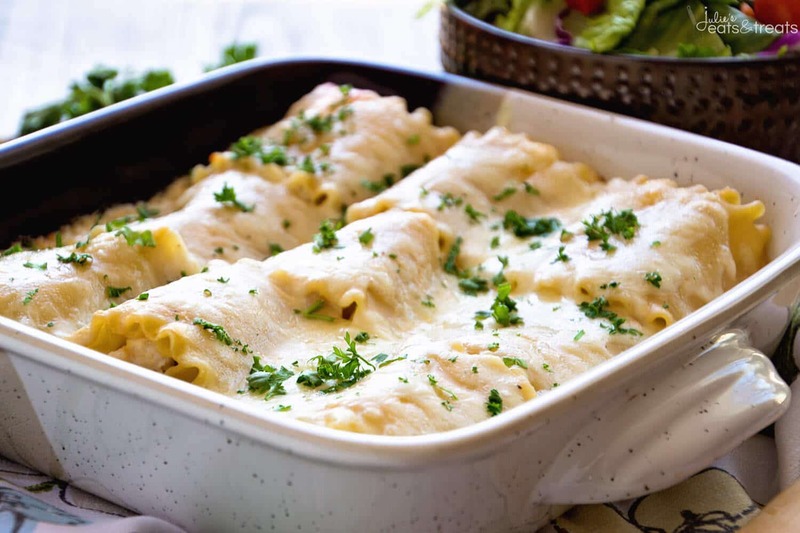 Creamy and Delicious Lasagna Roll Ups! 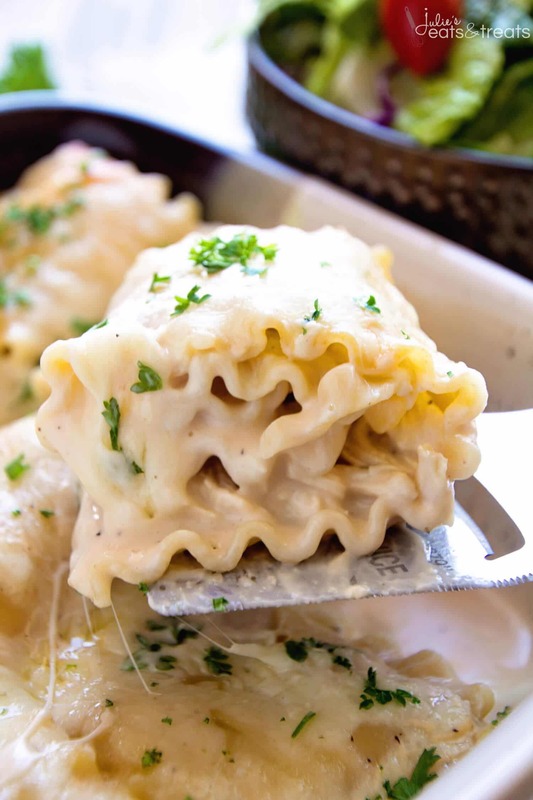 Lasagna Noodles Stuffed with Chicken, Cheese and Garlic Alfredo Make for a Quick and Delicious Dinner. Chicken is added in step 3, right? My kids love all things alfredo and all things in rolls (they’re kids! I don’t know), so this might just win me Mother of the Year Award! Can’t wait to try it out! How much Alfredo sauce would be used if you made it from scratch? Jarred Alfredo just isn’t the same if you know what I’m saying. ? I was wondering how you cooked the chicken? I’m a beginner and I really wanted to try this but I don’t know how this chicken should be cooked. Help please? Monica, I cooked the chicken breast in the oven. Either cut in half or pound it to make a somewhat even thickness. Rub it with a little olive oil, then salt and pepper or whatever your favorite seasoning is. Put it in a oven safe dish and cook at 450F for 16 – 18 minutes. Check internal temperature with a instant read thermometer, s/b 160F – 170F. Let cool. Enjoy! I have also boiled it for 15-20 minutes then shredded! I made this tonight and added some broccoli to it. It was great! Thanks for the easy instructions! So glad you enjoyed it Kayla! Hey Alexis! They would be a great option. I would chop some broccoli up and cook it in a steam bag like this – http://amzn.to/1XYn6as. The directions are on the back on how to microwave it. Super easy! Add it in step number 3! Good luck! I made the alfredo dish this afternoon and it was delicious. The only thing I would change next time is cutting the garlic salt in half. I am not a huge garlic fan so it was a little overwhelming. However, my family had no problem devouring it. I will definitely make it again! Glad you overall enjoyed it Cynthia! Fresh oregano? AND what about rotisserie chicken to speed up the cooking time? Rotisserie chicken would be a great shortcut and you can always add fresh oregano if you’d like that! Ive prepared this a head of time, is that gonna be a problem?? No I do it all the time! We love this meal and have had it numerous times. Wondering if it could be frozen and cooked later? Yes I have did that before! I made this for dinner today as I was looking for something quick and easy, plus I wanted to use up what was in the pantry. The directions is pretty easy to follow. I must say everyone loves it! Thank you… how do you come up with the nutrients guidelines??? My recipe card has a calculator in it. It’s approximate. Hello!! What brand of alfredo do you use? I’m not a fan of the jars but perhaps you have a better brand? I liked Bertolli’s. 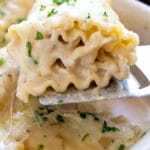 Have you ever tried a refrigerated alfredo sauce? I’ve heard those are good!